It came to my attention that Blondie gets left out of the blog, so here's a post just for her! Blondie is 15 or 16 years old. (There is confusion over just WHICH year she was given to Tim.) She is blind, mostly deaf, and very tired. Tim says he got her when he was 10 years old, she was just a tiny puppy. As a puppy, she was SUPER fast and very playful. She loved to hide her bones in the back yard. One time she even ran headfirst into a fence chasing a cat. She was Tim's dog through and through and he loves her. About 12 years ago, (when Frankie was 4), Blondie had her second litter of puppies. (Her mate is Mocha, Loren's mini poodle. Peaches, Beth's dog, is one of Blondie's puppies from the first litter.) My parents got Tippy, from the second litter. She is Frankie & Dad's dog. 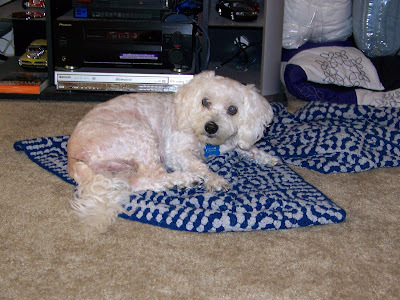 When Tim and I had just gotten the apartment, so the fall of 2005, Blondie's uterus got an infection. She was still living with Tom and Peggy. They didn't tell us anything was wrong with Blondie until she had stopped eating and drinking water. We rushed to their house. She was nearly dead. Tim convinced her to eat some deli meat and I used a syringe to put some water down her throat. We took her to the Emergency Vet to be looked at. The doctor said that there was a mass in her belly, possibly a tumor. We were so worried. Then he came back and said that he just realized Blondie was "in tact" and that the mass was actually her very infected and ruptured uterus. The condition is called pyometra. She had to have surgery right away to save her life. The doctor expected her to be OK afterwards, so Tim and I decided it was worth the $1,800. Tom and Peggy weren't willing to pay that kind of money. 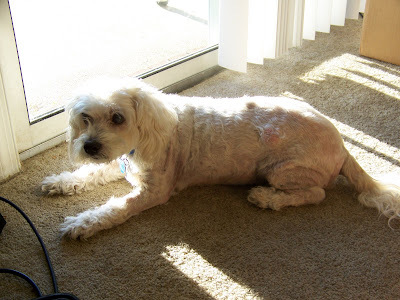 When Blondie got out of the hospital, we brought her to come live with us. We had spent the $$, she was going to live with us, and that's just how it was. A week after her surgery we had to take her to the vet to get her staples removed. Dr. Watts at PetSmart saw her and wouldn't even sell us an insurance plan, because Blondie was so pathetic, she didn't think she'd live. Two weeks later, after following the doctor's orders for (DAILY) baths, meds, and attention, we had nursed Blondie back to health. Dr. Watts said she was a new dog! We put Blondie on a PetSmart plan then. 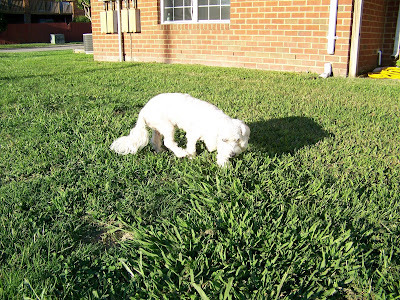 We used to put her out back of our apartment and she'd go to the potty and then wander around. She never went far and it was nice. We had a "stake and chain" that was really a nylon cord we could put her on if there were others around too. At one point, when we still lived in the apartment, the doctors told us Blondie had a liver problem and that she'd need put down or would die soon. We went home and cried and cried and were so upset. It was April. 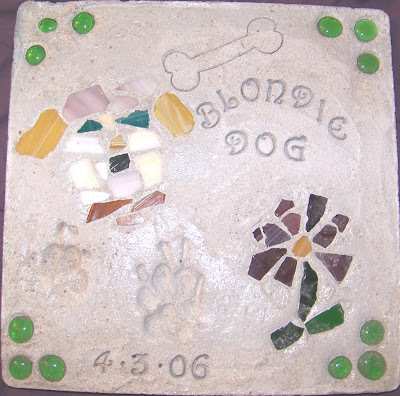 We went out and bought a stepping stone kit and made Blondie a stepping stone with her paw prints, that date, and some gems on it. However, Blondie had other plans. She started eating again and within just a few days was fine. That's the first time we said goodbye. Then, shortly after we moved into this house, we were locking Blondie in the guest bath when we weren't home and at night, because she was not holding her bladder. She would CRY and CRY all night, so we were sure she was in some kind of pain. We discussed putting her down. Then, we decided to stop locking her up. Sure enough, she stopped crying. She wants to sleep with us. That was the second time we said goodbye. 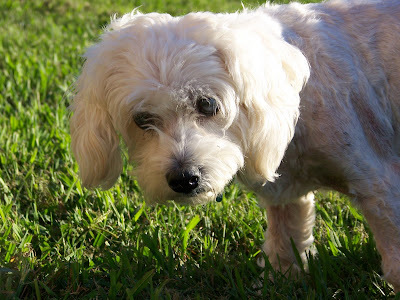 More recently, Blondie has lost all control of her bladder and bowels, and she cries sometimes. She also has a little bit of a stuffy nose. She's still eating and drinking though. All she does is eat, sleep, pee, and poo. She sometimes growls or snaps at Rosie if she gets on her nerves. She really likes to climb into the baby bouncy chair and sleep in it. She has a blanket that's all her own. Within the last month, Peggy has been nagging us to put Blondie down. She even went so far as to say that she'd pay for it if we did it this Saturday. When we declined her offer, she THREATENED to do it while we're away. Tim was actually ok with it and ready...but then we talked last night. We had decided a while ago, that we'd put Blondie to sleep, if she stopped eating/drinking again. She's STILL eating and drinking. She's not in chronic pain as far as we can tell. She doesn't cry or whine when we touch her or pick her up. She eats and moves and does her business. She's old. Kind of like my Grams. Grams wears diapers because she can't control her bladder/bowels either. She eats mush and not much else. She doesn't go out unless she's got money to spend. She barely socializes and spends all of her time in her room. Should we put Grams down? NO! So why should we put our Blondie dog down? I'm pretty sure that we are now on the course to let Blondie choose when she dies. Tim's sincere hope is that she just goes to sleep and then doesn't wake up or that she comes to us and then dies in our laps. Anyway, Blondie dog, we love you! PS. Blondie even has a Dogster page! Check it out! Aw, poor Blondie. Good post about her! I love the stepping stone; I've never seen it?? Did I ever tell you about Johnny? He was old, too, losing all his functions, etc. We were on our way, that day, to take him to the vet to be put down. I reached under the desk to get him, and there he was, stone cold and hard as a rock. He knew when it was time, and I was so glad not to make the decision for him. Still, sometimes it really is the most humane thing to do... I hope she decides soon, for everyone's sake! Wait, I don't think that came out right. I don't mean "Gee, I hope your dog dies soon" so much as "I hope she puts herself out of her misery if she's in it..." ah, never mind!! !